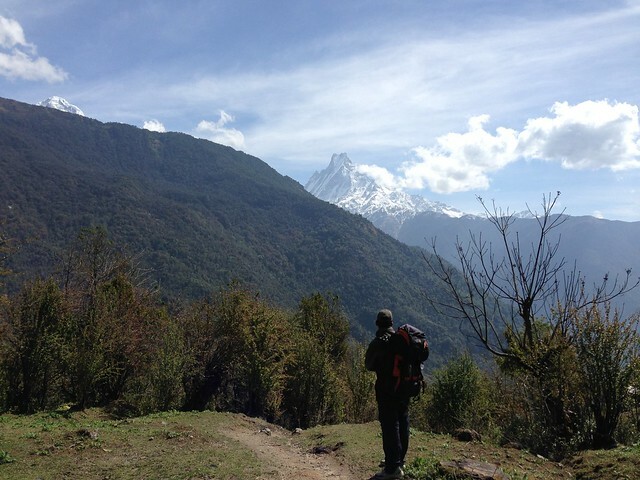 By now, I was getting used to life on the Annapurna trail. 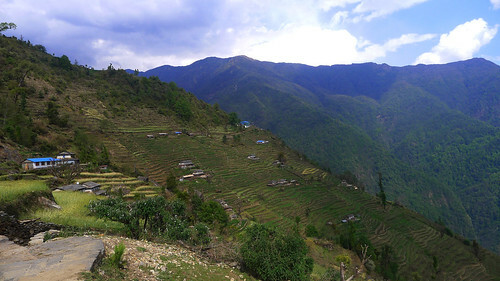 I never felt I had to worry about oxygen intake (unlike during the Everest Base Camp trek), but what occupied my thoughts were the trail paths, which were significantly more challenging in this region. I was dealing with minor knee injuries prior to my ABC hike, and the pain from these injuries felt magnified on the trek itself. Day 4 was relatively easy, because it was all about descending from Tadapani (2,710 meters) to Chhommrong (2,210 meters / 7,249 feet above sea level). However, just because the altitude was lower didn't mean the trail would be easy peasy the whole day. Lazed a bit after my breakfast in my Tadapani teahouse and went online to do some Facebook and Instagram updates--which earned me a glare and some tsk-tsks from my ever strict guide Madan. I think he was anxious for us to leave at 8:00 am but because I dallied and took my time, we ended up leaving at 9:00 am. 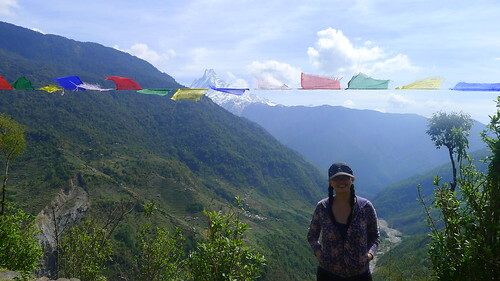 It was a 6-hour trek, excluding lunch hour, to Chhrommrong, a popular stop known for its stunning views of the Annapurna range. 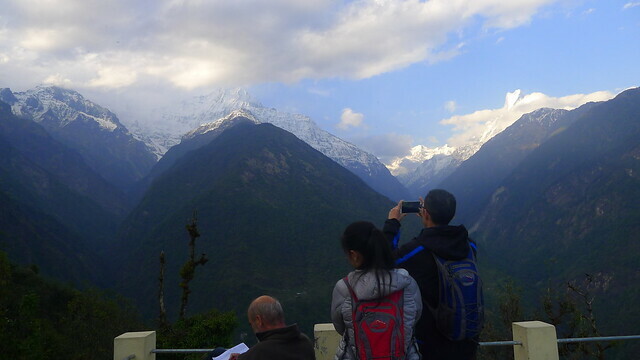 (To be honest, everywhere you go in the Annapurna region seems to boast of fantastic scenery, so there's actually no shortage of mountain views.) Since I left Tadapani at 9:00 am, I was gunning to reach Chhommrong by 4:00 pm. It was a good day for photo op breaks! To make up for my tardiness, I sped down the rocky path. Sort of a bad thing to do. The first 2 hours would mean 100% descent. My knees took a beating again (honestly, this is beginning to be stale news already) and at some point, I was afraid they would collapse. When you're going downhill for 2 hours without breaking pace, it can get totally tough on the knees. Then for some reason, my stomach started acting up, and I realized I BADLY needed to go to the toilet. It was that urgent. Fortunately, I spotted a teahouse in the middle of nowhere, and I made a beeline for it, leaving Madan behind. The teahouse looked abandoned when I reached it; I was panicking because I wanted to ask for permission to use the toilet but there wasn't anyone around. I wasn't sure if I could just use the toilet without asking. Went around the teahouse a bit and hollered 'namaste, is there anyone here? ', but Nature was desperately calling. And so I let go of whatever social graces I had left, and just rushed to the squat toilet (the only available toilet, period), which had no water, no light and no windows. Nothing. It was just a little outhouse with a hole in a middle and with a door that could hardly close properly. But when I had to go, I just had to go. Okay, that was too much information, but it just goes to show that I've become really skilled at taking a dump at just about anywhere on this trail. Trekkers can't be choosers. The pretty countryside. Chhommrong was near, at this point. The rest of the day was pretty uneventful. Descended some more, and in my mad rush, I overtook a lot of trekkers. My porter Hari and I kept pace with one another while Madan dawdled a bit and was left behind (but since he's ultra fast, he could always catch up with us whenever he needed to). As Hari and I tackled some uphills after lunch, I would watch him RUN up the steps effortlessly with my rucksack and his stuff on his back--which amounted to around 12 kilos or so. It was insane. The Nepalis never fail to amaze me with their speed and strength. They own the mountains, I'd say. I asked Hari why he was so annoyingly fast. He laughed and said that he was in the army some years back. As part of their drills, they had to run up and down the mountain paths with 25 kilos each on their backs. Okay, that explained it. Hari wasn't as fluent as his brother Madan when it came to English, but we managed to communicate well and laugh a lot in between. He taught me some general Nepalese words, and he asked me the equivalent of those words in Filipino, which pleased me a great deal. Our mini language lessons helped pass the time, especially during the uphills--and by 3:30 pm, I had reached Chhommrong. I was ahead of plan by 30 minutes, hooray! As I sat inside the dining hall of my teahouse, I watched from the window as trekkers trickled into Chhommrong between 4 to 4:45 pm. Hmmm. Could it be that I had done very well today after all? This trek was never really a competition anyway, but it felt good to test my limits and speed up on the trail sometimes. Got into a conversation with a solo Canadian trekker, and we basically swapped stories about our knee injuries. He had to take Ibuprofen every 8 hours because of the grueling trail path. I was to run into him every now and then all throughout the ABC trek. Dinner was so-so; I didn't have much of an appetite, as usual. But the dining hall was a great place to be in, and there were loads of fellow trekking guests. Hari taught me some new card games, and so I played with the boys, with other guys standing by watching us. It seemed I really had beginner's luck that night, and won most of the games. Madan had warned me that tomorrow could be a challenging day for me, so I decided to rest early. And like what I did on previous days on the trail, I could only pray that my luck would hold out 'til I reached my destination. Watching the day end in Chhommrong. The clouds were starting to roll in. I couldn't believe that in two days, I would be at the base of THOSE mountains.